Fair warning: I can totally understand if you’re bored silly by the idea of reading about someone else’s Christmas. But since this was the achievement of a lifetime goal, I’m recording all the little details here for posterity’s sake as part of my memories book. 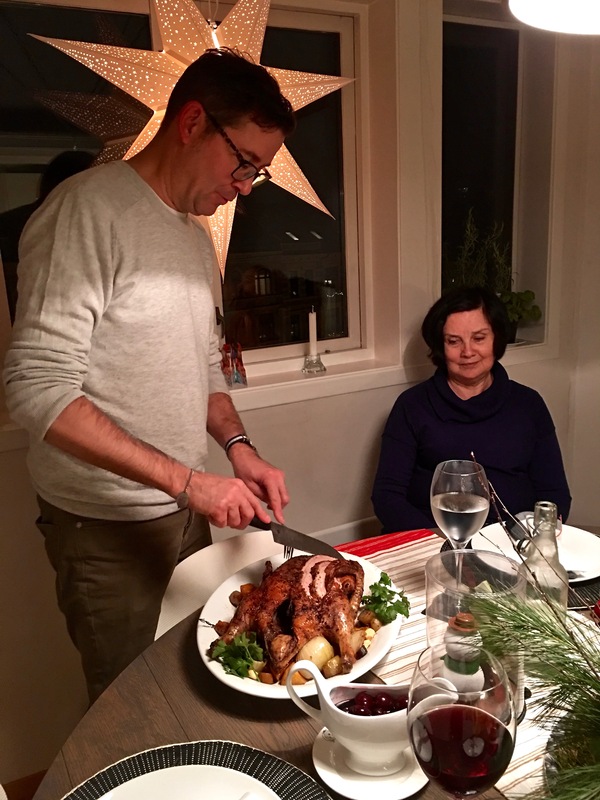 Feel free to continue following along if you’d like to see how a couple of Americans appropriated Norwegian customs into their family holiday…. 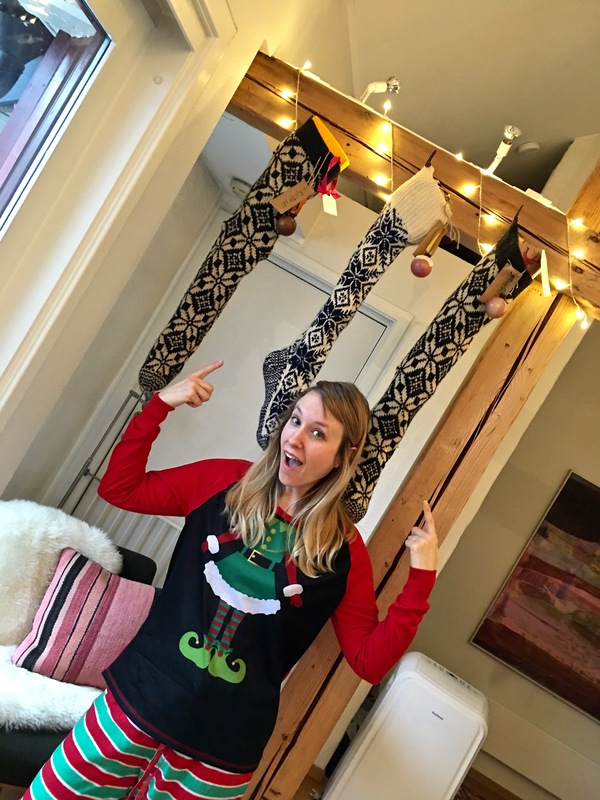 My sister Ruthie shows her enthusiasm for the Norwegian knitted stockings that the Julenisse has filled for her, my niece, and mom. 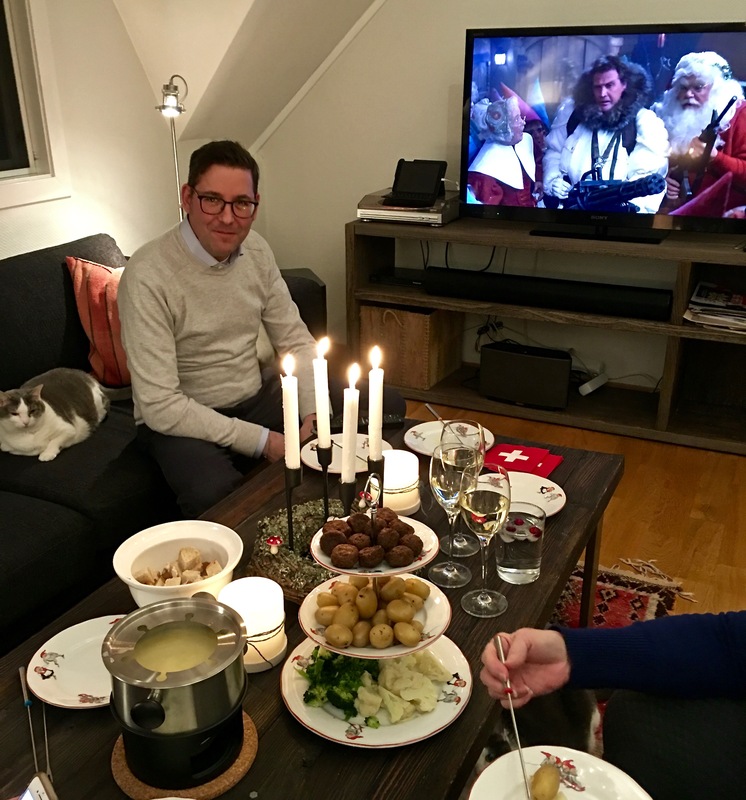 To begin with, our entire apartment got a liberal coating of Christmas, Norwegian-style to give my family a sense of how different seasonal celebrations can be in another country. Up went the following key components: a birch wreath on the front door, a Julenek (Christmas wheat sheaf for the birds) on the terrace, and a Julebukk (Christmas goat) and trollhassel (curly witch hazel branch) in the entry foyer. Fresh holly, pine boughs, red roses, amaryllis, and other bulb flowers brought more live nature into the house, always a big theme in Norwegian holiday décor. Next we bedecked the tree itself with traditional straw ornaments, paper stars, red mushrooms, and pigs (symbols of good fortune). And then we shopped like maniacs for all the ingredients necessary to make the typical Norwegian Christmas foods that I planned to serve. My sis took this panoramic of the entire living room, complete with decorated tree, tabletop advent wreath, apples on the mantle, and stockings hung by the fireplace and along the rafter. The knitted socks are called “strømper” and are from old bunads (national costumes) for men. We got them at Uff, a second-hand store, because they’re crazy money when new. If you’re ever looking to pick up a cheap Norwegian folk costume (and who isn’t? ), Uff’s the place to go. We picked a kind of blue spruce this year, not only because it was so elegant, but also because it was tall and skinny, meaning it fit snugly into our available corner nook. It also had an amazing scent, almost like oranges. Look closely to see the red pigs and mushrooms, which seem to be a constant on most Norwegian Christmas trees. Curly witch hazel branches (called “trollhassel” in Norwegian) often act as a kind of surrogate Christmas tree for displaying ornaments. The Julebukk (Christmas goat) dates back to Viking times and even earlier. Slaughtering a goat for the solstice was a pagan custom, and it’s also said that two goats named Tanngrisnir and Tanngnjóstr pulled the Norse storm god Thor’s cart across the sky. When Christianity came around, goats became associated with devilish pranks during wassailing, and later the horned rams were appropriated as the livestock that pulled the Julenissen’s cart of gifts … before Santa and his reindeer took over. Speaking of bountiful harvests, we reaped many of the ingredients for our Christmas meals from one of our favorite stores, Fjelberg’s (http://fjelberg.no/), where you can get incredible lobster, shrimp, oysters, and fish (as the sign says.) We literally hand-selected the oysters, then the staff shucked them for us right there! For our meats and cheeses, we hit another of our beloved neighborhood haunts, Frogner Special (http://frognerspecial.no/). The last couple of years, we’ve gotten our Christmas duck here and have never been disappointed with how meaty, juicy, and tender it is. That’s me on the left, behind the Julenisse mask. 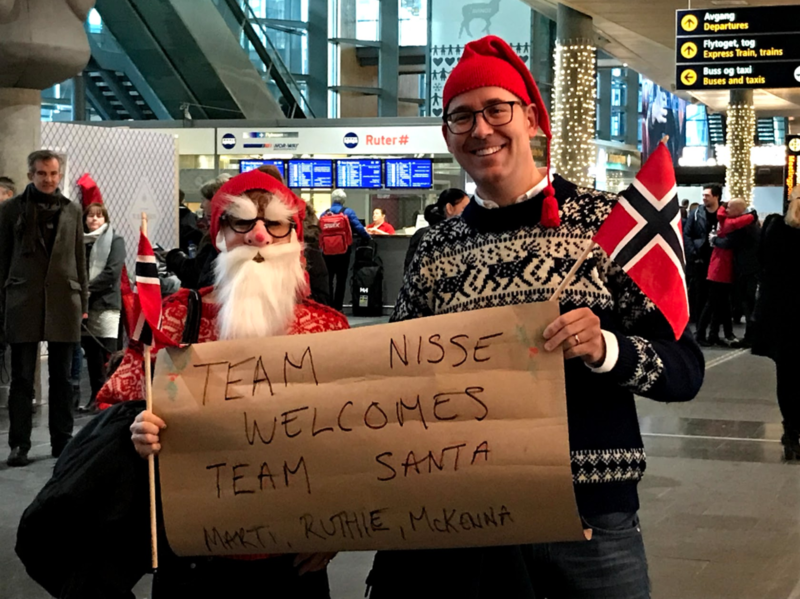 I’m just about the right height for a nisse. The family finally arrived the day before Christmas Eve. To get the party started, we dressed as Julenisser (Christmas elves) and met everyone at the airport. Yup, we got a lot of weird looks. But the payoff was seeing my family’s jet-lagged faces burst into laughter when they finally recognized us. And later, I got what I consider to be a supreme compliment when a Norwegian man tapped me on the shoulder to tell me, “That’s a lovely Christmas outfit you’re wearing.” I’m choosing to believe he meant that honestly and not sarcastically. My niece gives the Vinterland Julemarked’s animatronic singing moose the thumbs up. 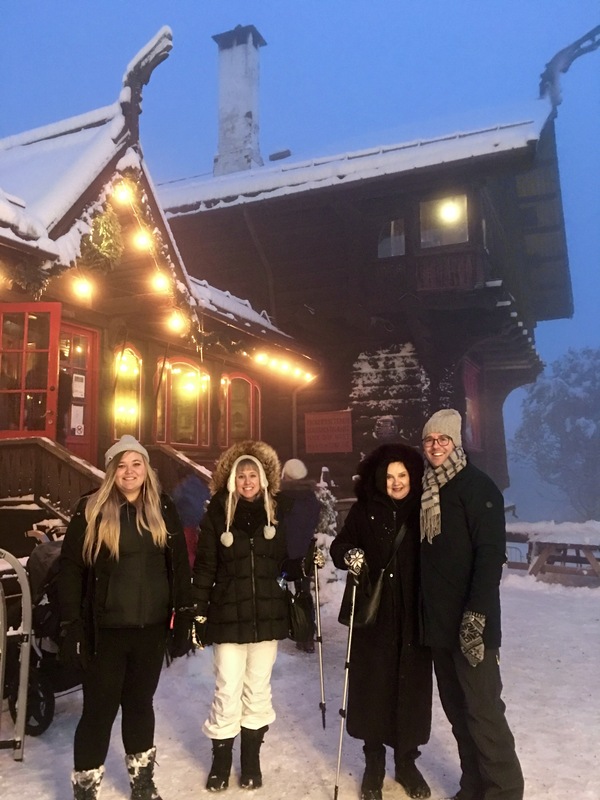 After a two-hour nap, my family felt ready to see the sights, so we did a quick run through the Jul i Vinterland Christmas Market for some shopping, sausage tastings, and a few cups of gløgg. 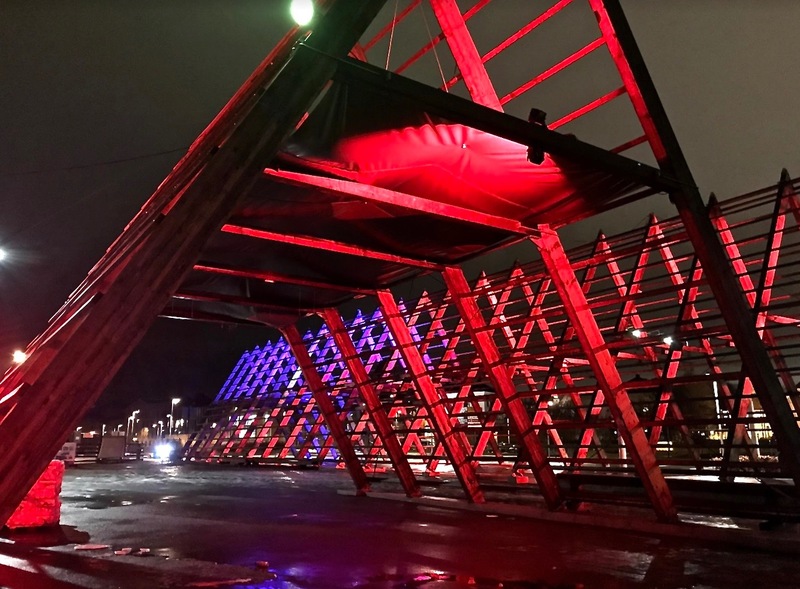 Then we promenaded along Aker Brygge, the ritzy wharf development right along the harbor, to view the elegant Christmas lights. Dinner found us at Rorbua, where we partook of some traditional holiday foods like pinnekjøtt and ribbe. Being as they’re not big fans of pork or lamb, my family nibbled these warily. But they loved the salmon and pronounced the reindeer “surprisingly delicious,” so I consider this a victory. Entry to the Vinterland Julemarked is free. Of course, you’ll pay a nominal amount for the sausages, gløgg, and rides on the Ferris wheel. My niece and I shopped quickly at the market stalls before everything shut down at 6:00 p.m., when Lille Julaften began. The literal translation is “Little Christmas Eve.” Since the big day in Norway is the 24th, the 23rd is when the holiday officially commences by decorating the tree and having an informal family meal. Aker Brygge has some gorgeous holiday displays — I love the Christmas trees made from balls of light. 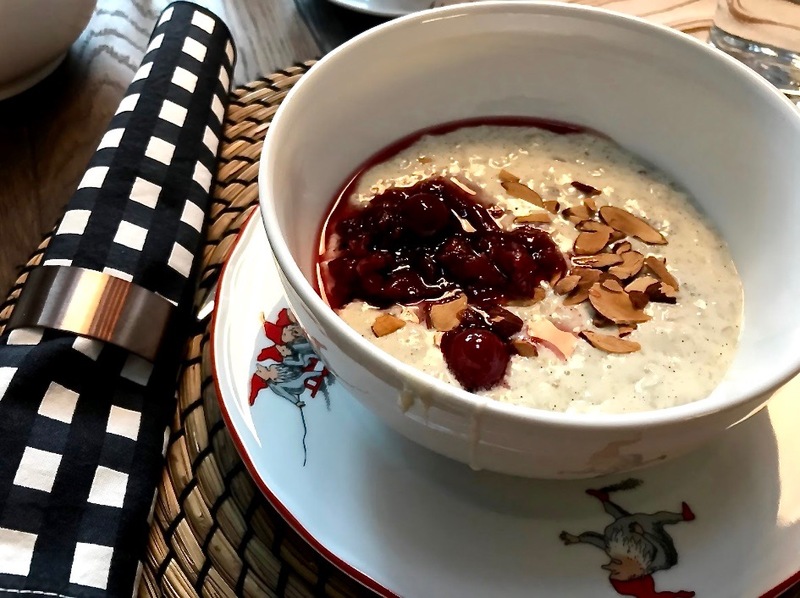 While porridge sounds boringly healthy, consider that the ingredients include white chocolate, heavy whipping cream, and a compote topping of dried cherries with toasted almonds. As I expected after such a long flight, everyone slept quite late the next morning. Good thing, because it took about 50 minutes for me to soak, cook, and wrestle my first batch of traditional Norwegian porridge to the correct consistency: somewhere between creamy and sticky. I finished it off by dropping a whole almond — blanched to make it virtually invisible — into the slop before ladling breakfast into bowls. According to custom, the lucky person to find the nut (my mom) got rewarded with a jolly marzipan pig, an emblem of good fortune in the coming year. Other side dishes included brunost (brown cheese) on Julekake (a kind of cinnamon raisin bread), and gravlaks (cured salmon) on knekkebrød (a cracker made from seeds and whole grains.) End result. No need for lunch. Pictured is the knekkebrød, gravlaks, julekake, and brunost — brown goat’s cheese made of caramelized whey and cream. It’s an iconic food here in Norway, and folks argue over the many artisanal varieties like sommeliers debate vintages. We bought our block of brunost from a farmer at a local street market, but I’m told that Trader Joe’s now carries a Norwegian brand. If you haven’t yet tried it, go buy some — it’s delicious!!!! My sister Ruthie eyes the porridge and pig somewhat suspiciously. The porridge turned out to be a hit, but the marzipan, not so much. I’m crazy for the stuff, but it seems like marzipan must be an acquired taste. It has a slight bitterness to its almond flavor and isn’t so sugary sweet as most American treats. We finished our breakfast just in time to head to the Domkirke, Oslo’s Lutheran Cathedral, for a 1:00 p.m. Mass. My mom had picked the earliest service in order to hear the boys’ choir perform, and they didn’t disappoint. We all even attempted to sing along to the familiar Christmas tunes using the Norwegian hymnal, but our poor pronunciation started everyone giggling, so we reverted to English eventually. Afterwards, we strolled along some of the streets to see more of Oslo’s Christmas displays before heading home to get dinner going. 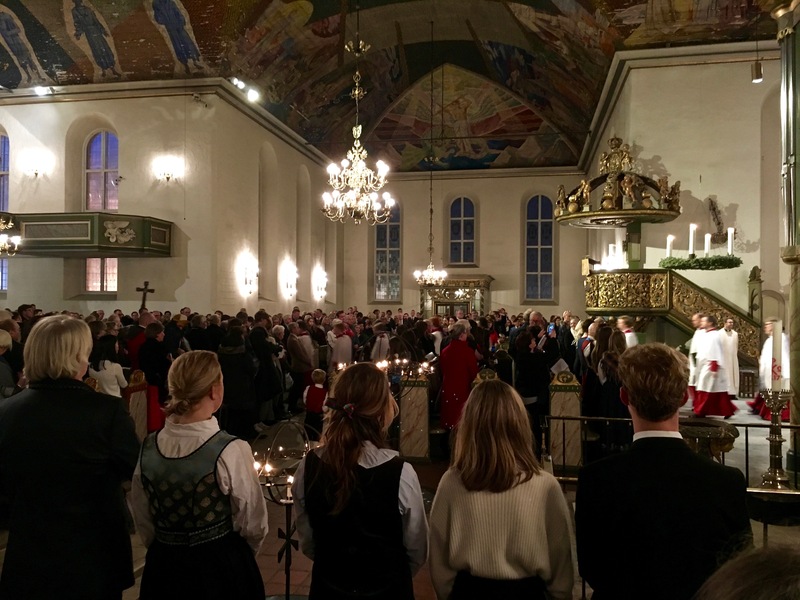 My sister Ruthie took this awesome panoramic of the Domkirke’s interior, so that you can see the altar and both transepts. A priest gives his homily from the Baroque gilded pulpit. Matthew gets a little too excited about the Christmas light display. The ritzy department store Steen & Strøm created some fun holiday windows featuring Disney princesses in haute couture gowns by Scandinavian designers. Here’s Cinderella, or Askepott (“Ashes Pott”), as she’s known in Norwegian. Here’s Elsa from Frozen, a story inspired by Norwegian folktales. The Disney team actually traveled to Norway to get design ideas for the movie’s visuals. Dinner included Swiss fondue and the movie “Scrooged.” Who can forget the pivotal scene where Lee Majors (“The Six Million Dollar Man”) rescues Santa. Why six million, by the way? Seems like a weird number. Why not five, or ten? These are the things you contemplate after a few too many cocktails. 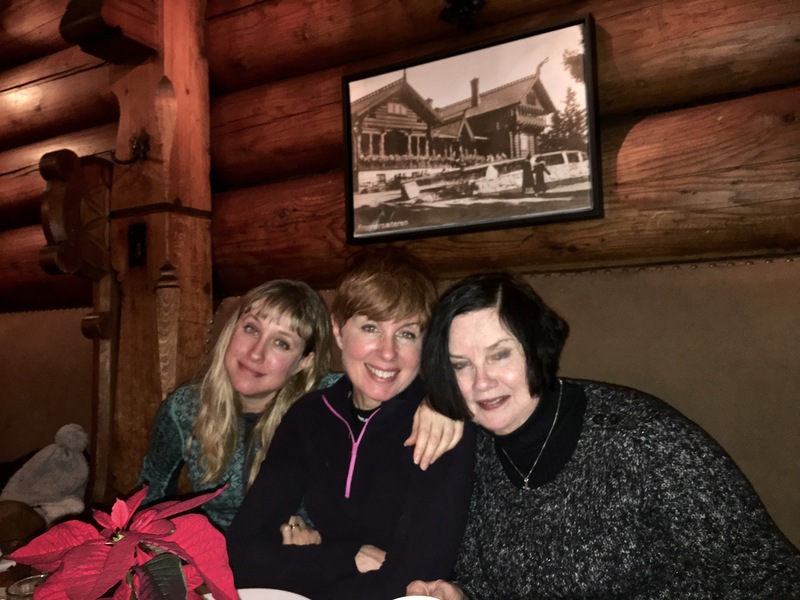 According to family tradition, our Christmas Eve supper started with oyster stew, followed by Swiss fondue, topped off with a tipple of our usual Corpse Reviver cocktails (it’s a long story.) We followed up dinner by watching some American Christmas classics and an odd, disco-era TV special that plays every Christmas Eve here in Norway. The hair and makeup department clearly got paid overtime for this production of “The Rock-n-Roll Wolf,” or “Grimm & Gru,” or “Ma-ma,” whatever you choose to call this odd holiday production. Watch an English version of it here if you’re interested — and fast forward to the last ten minutes for the ice acrobatics. Not even remotely Christmasy, it’s like an LSD-fueled crossover between a ballet, the Ice Capades, a circus, and the musical “Cats.” We’ve never been able to figure out exactly what it’s called, or even what it’s really about, except that it features a sly wolf and a suspicious mother goat who’s kids seem to be getting kidnapped for cash (supposedly the story is a Grimm’s Fairy Tales knockoff.) But the costumes and makeup are fascinatingly psychedelic, and after a few Corpse Revivers, who’s able to follow the plot line anyway? So I did a little more research on the program, and get this: it’s a 1976 Romanian-Soviet-French co-production. How’s that for a weird combo? Even weirder, the cast members were from the Moscow Circus, the Moscow Circus on Ice, and the Bolshoi Ballet. The music is pretty funky, too, ranging from rock opera, to David Bowie-esque, to disco, to classical. The movie was filmed simultaneously in Romanian, Russian, and English, but it plays in Norway with Norwegian subtitles. In this photo, you can see the Mama Rada goat character in the background, looking on as what appears to be a squirrel version of the Rockettes takes to the ice. Don’t laugh; in 1977, the movie won the Silver Cup at the Children’s Film Festival in Venice. Real candles … and no injuries or house fires, by the way. Midnight found us engaging in our usual corny traditions of reading the Christmas story and singing carols. (We’re one of those goofy families who likes to go through the entire songbook on Christmas Eve.) 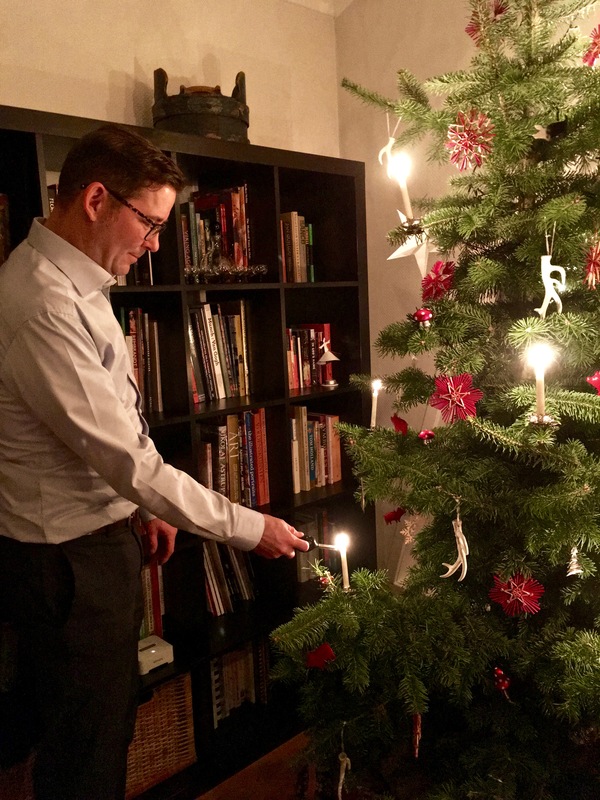 But this year we introduced a Norwegian custom to the mix — we had each member of the clan take a turn lighting real candles on the Christmas tree. Ideally I’d have loved to dance around the tree like Norwegians do, but I need someone to teach me the songs and steps first. Maybe someday…. Standard fixin’s for a Norwegian waffle include brown cheese, raspberry jam, and sour cream. Christmas morning I subjected everyone to my first attempt at making another typical Norwegian breakfast — waffles flavored with cardamon. Thankfully everyone slept in again, because it took me a half hour just to crack open all the pods and crush the seeds to a powder. We finished eating barely in time to get dressed and head off to a matinee of “Star Wars: The Last Jedi.” Let me explain. Seeing a movie on Christmas Day is another family tradition. And, we’re all rabid SW fans, except for my niece McKenna, who somehow never got the memo and has never watched any of the films. Still, she grudgingly came along to see what the fuss was all about. 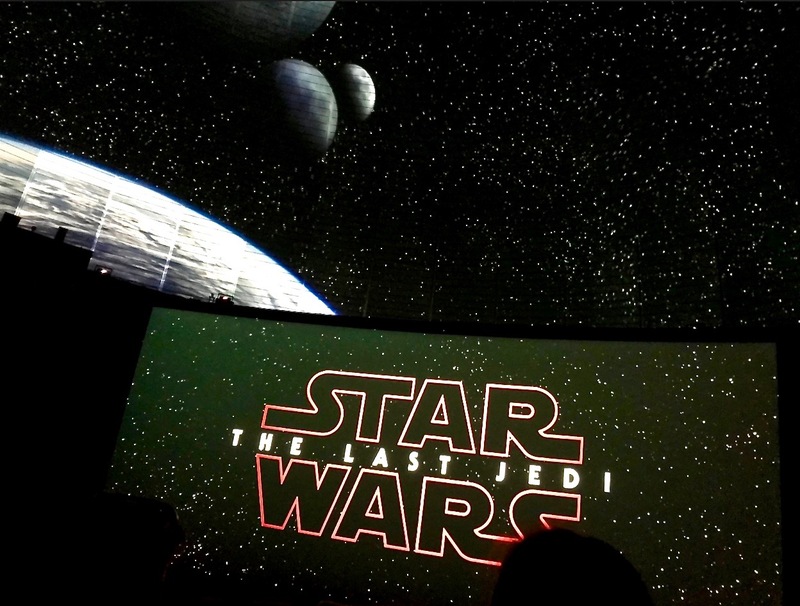 Check out the movie screen, with the dome above it holding a 360-degree view of a space battle for The Last Jedi pre-show. I especially wanted everyone to experience the movie at the Colosseum, the largest movie theater in northern Europe. The main salon sits underneath a huge dome, and for the pre-show spectacle, a “live” space battle between The First Order and the Rebels played across the curved ceiling. I have no idea how the theater got access to such great CG footage, but it created an immersive environment similar to a planetarium. We all geeked out over it, and if you’re interested, watch my sister’s video clip here. 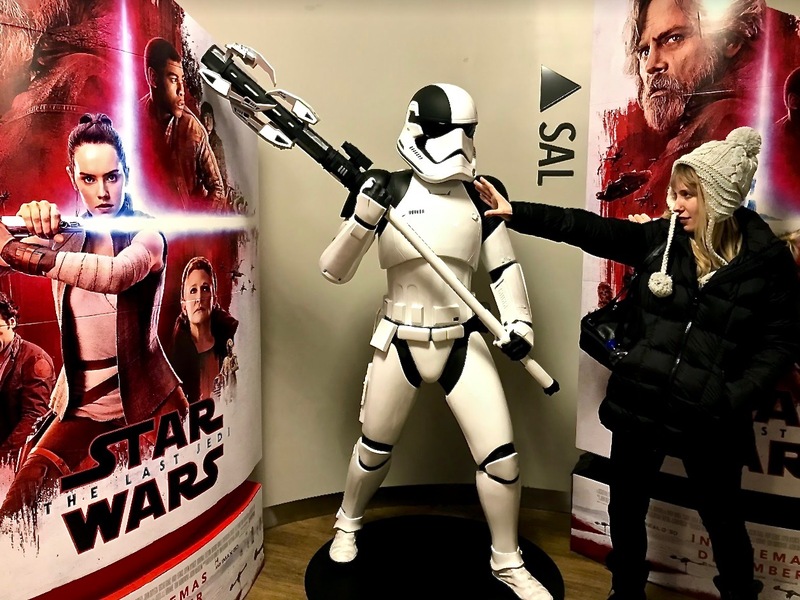 Ru attempts to disarm a storm trooper using the Force — which in Norwegian is called “Kraften” (the Power). The film’s Norwegian subtitles also got a “thumbs up” from the family. Except that other audience members repeatedly turned around to give us the “big eye” during tense moments because we kept inappropriately cracking up at the translation of “Full speed!” as “Full fart!” (What can we say? We’re 12-year-old adolescents at heart.) Anyway, my niece is now a SW convert, although some of her enthusiasm may have been generated by the scene where Adam Driver goes shirtless. But at least she and Ru enjoyed it enough to ham it up with some of the theater props afterwards…. Check out the dome from the outside. In Norway, you have to reserve theater tickets in advance. And you buy your popcorn already boxed from a huge row of heated dispensers that look like giant grocery-store coolers. Soft drinks are canned, not fountain. And an entire room is devoted to candy. Yep, my family got a chance to see how different the movie-going experience can be overseas. Ru almost bought a pair of these awesome Kylo Ren 3-D glasses for her boyfriend, who’s as big a sci-fi geek as we are. But then she thought better of it, for fear he’d take to wearing them daily as sunglasses. This merry-making storm trooper appropriately likes Stratos candy bars. McKenna, cloaking herself to look like Rey, takes a more physical approach with her opponent. That night back home, I served a late dinner of roast duck with cherry sauce, root veggies, haricots verts, and lavender crème brûlée. (French cuisine seemed a safer bet with my family than lutefisk and other typical Norwegian holiday foods.) And then we ransacked our stockings and opened gifts before heading off to bed. The next day, we caught a train to Gothenburg — Sweden’s second largest city — so that the fams could get a chance to experience another Scandinavian country. 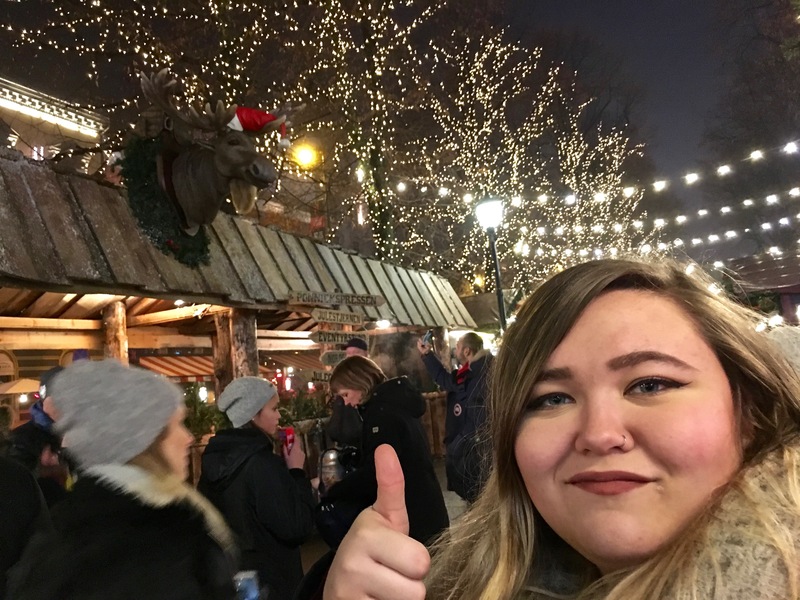 A late start meant an early-evening arrival with only a couple of hours remaining to blitzkrieg the incredible Christmas market at Liseberg amusement park. 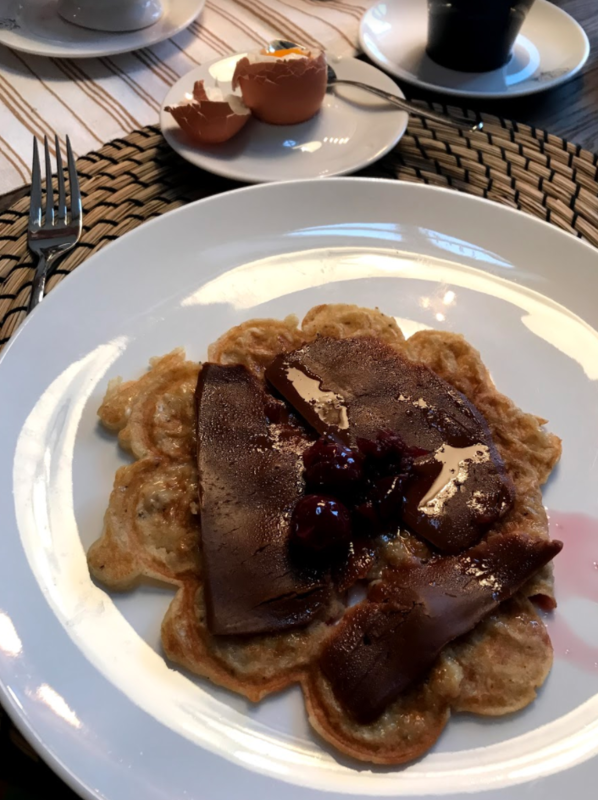 Since our first priority is always food, we made time for a really terrific dinner at Liseberg’s Wärdshus, then caught the end of the ice show, followed by fireworks, and the Scandi design market. A short but sweet visit. In Gothenburg’s gorgeous train station, the whole family has assembled beneath the Tre Kronor — the three crowns on the blue medallion that is the national symbol of Sweden. We’re standing in front of the main gate to Liseberg, one of the most visited amusement parks in Scandinavia, and one of the world’s top ten best amusement parks, as selected by Forbes magazine. Matthew’s clearly thrilled about the awesome Christmas displays at Liseberg. An overview of Liseberg at Christmas — totally worth a trip! Liseberg’s Wärdshus restaurant is perfect for dinner and a warm ringside seat to watch the Nutcracker on Ice show. A truly unbelievable dish of cod with mussels — we couldn’t stop raving about it. I don’t normally associate such fine cuisine with an amusement park, but the meal was quite impressive. Towards the end of the evening, Liseberg pulled out all the stops on their fireworks show. Café Husaren advertises itself as “Home of the Hagabullen,” the world’s largest kanelbullen (cinnamon buns). Seriously, these things are Princess-Leia-hairdo-sized. 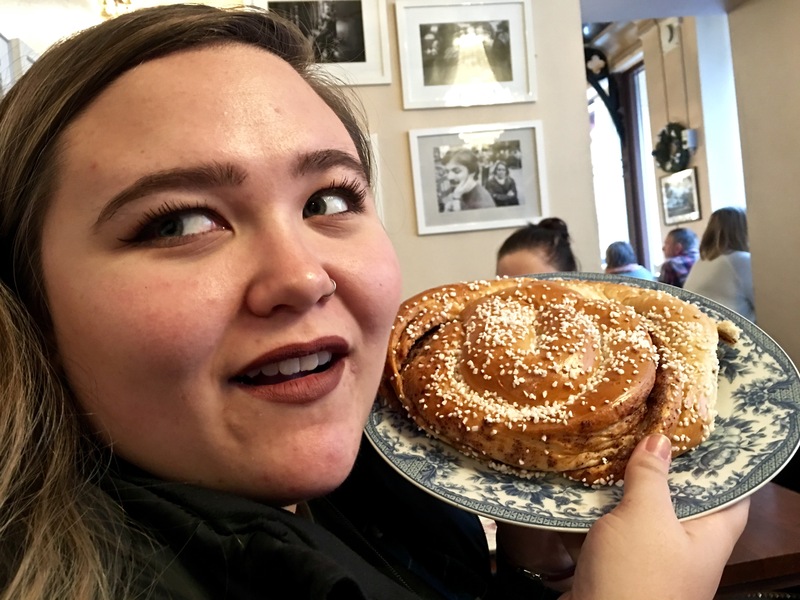 The next day, we leisurely wandered through the historic Haga neighborhood, stopping long enough to consume the world’s largest cinnamon buns during a fika (coffee break) at Café Husaren. We then worked off our carb overload by hiking up Risåsberget Hill to Skansen Kronen, an old fortress with a phenomenal view out over the city. Lunch found us at Feskekôrka (“fish church”), where kneeling in thanks for the mouthwateringly fresh seafood seemed totally understandable. And across the street, we discovered the Boulebar, dedicated to the French ball game similar to Bocce. Matthew and I have spent many fond hours tossing the boules during our travels to France, so we gave lessons on how to play … and then promptly had our asses handed to us on a plate by newbie McKenna. Built in the 19th century as one of Gothenburg’s first suburbs, the Haga district makes for a picturesque stroll even on a cold, dark day. Adorable wooden houses filled with shops and restaurants line its cobblestone streets. Completed in 1697, Skansen Kronan originally sported 23 cannons as an intended defense against the Danish, but it was never attacked. The fortress was later turned into a prison, a residence, and a museum, and today it’s a special events venue. The view from Skansen Kronan out over Gothenburg is worth the 100+ steps to the hilltop. Looking out over the red roofs of Gothenburg (spelled Göteborg in Swedish), you can get an idea of its size. As the sixth largest city in Scandinavia, it has quite a lot to offer in terms of museums, shops, restaurants, and nightlife. You can see how Feskekörka (“fish church”) got it’s name. Gothenburg’s city architect, Victor von Gegerfelt, claimed he was inspired by Norwegian stave churches and stone Gothic churches. Built it 1874, the building served as the city’s primary fish auction site until 1910, when the auction was moved to the new fishing harbor, Majnabbe. Supposedly, the architect wanted to create an interior space devoid of columns, which is kinda weird, since his inspirational stave churches are full of columns (in Norwegian “stav” = “columns/rods.”) Four fishmongers and two restaurants (Kajutan and Gabriel) operate out of Feskekörka. The place features one of the widest varieties of both fish and shellfish that you’ll find in any market in Sweden. Fabulous fresh oysters at Kajutan, a restaurant inside Feskekörka. Ruthie displays the classic Boule (meaning “ball”) stance. If you’re from Provence or French Canada, you might know the game as Pétanque. The object of the game is to toss a croquet-sized, hollow-steel ball from within the circle and come closest to a tiny wooden pink ball, called the cochonette (little piglet). The Boulebar serves up great beer, and of course as the chalkboard says, lots of pastis (a licorice-flavored liquor that you mix with icewater). By the way, notice the bartender, who’s appropriately dressed in a striped Breton shirt. 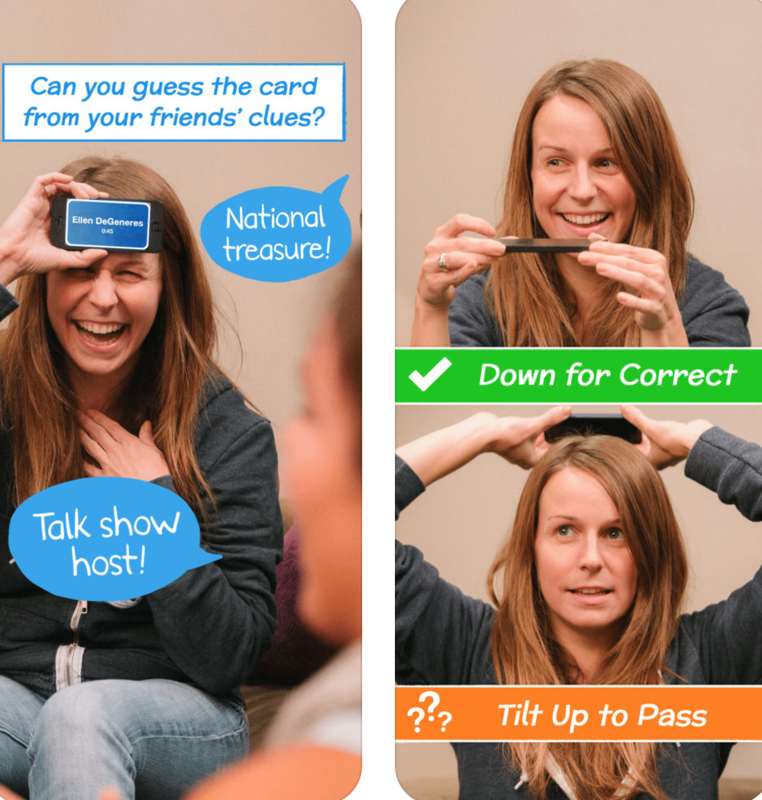 American talk show host Ellen Degeneres created the iPhone app “Head’s Up,” which is kinda like Charades. As you can imagine, it’s not really a quiet game meant for sedate spaces such as first-class train compartments. The train trip back to Oslo that evening proved entertaining for everyone. Not only did we amuse (and possibly annoy) our compartment companions by being stereotypically loud Americans while playing a game of Head’s Up!, but we got a front-row seat to a Border Patrol “raid.” For the first time ever when crossing from Sweden into Norway, our car was boarded by officers, who asked to see our bags. Our souvenirs passed inspection, but a group of guys in front of us got busted for their wrapped Christmas presents — which included fireworks, bows and arrows, and a small rifle. Sorry fellas, I guess the pretty paper didn’t fool anyone. Nope, I don’t have photos of the Border Patrol bust. I think the officers would have frowned on that. But click here to read an American hunter’s article about Swedish gun control. 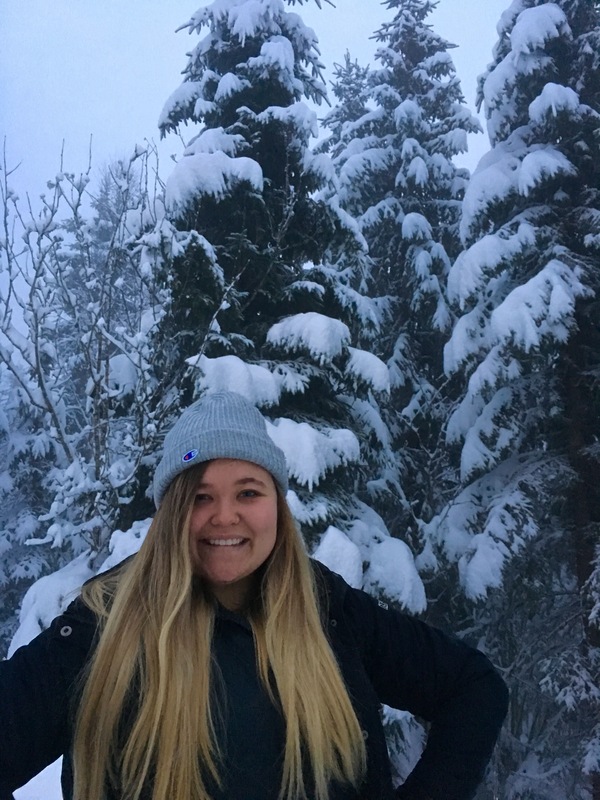 McKenna’s pretty thrilled with the winter wonderland at Frognerseteren, the last stop on the T-bane’s Line 1. Back in Oslo, we had one more day together before my family had to head home. And fortunately, it was a snow day. 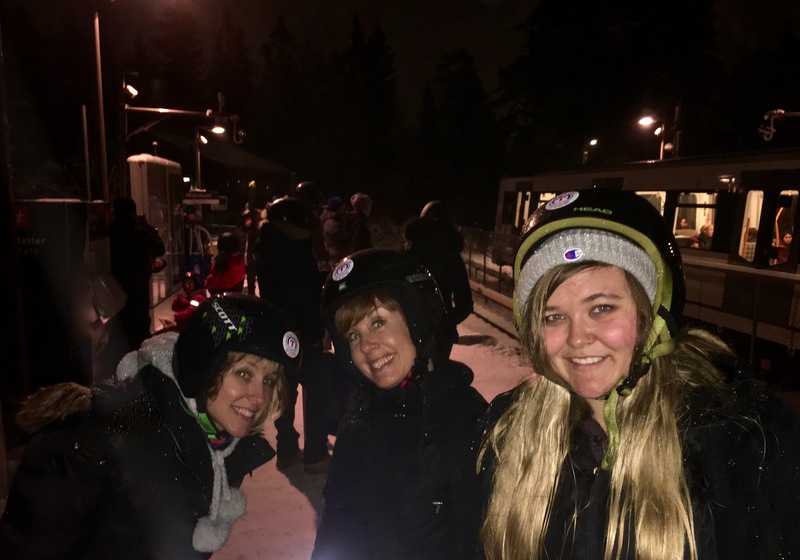 So we all boarded the T-bane (metro/subway) and headed up the mountain above Oslo for some sledding. Getting off at the end of the line revealed the kind of wintry landscape that my family had originally hoped to see in Norway — trees bowed with snow, feather-sized flakes still coming down, and knee-deep drifts to remind everyone that they weren’t far from the Arctic Circle. Enough coated the ground to allow for an impromptu snowball fight, something we don’t get to indulge in much in our home state of Kentucky. How’s this for a Currier & Ives setting? McKenna scores a direct hit to her Uncle Matthew’s head. 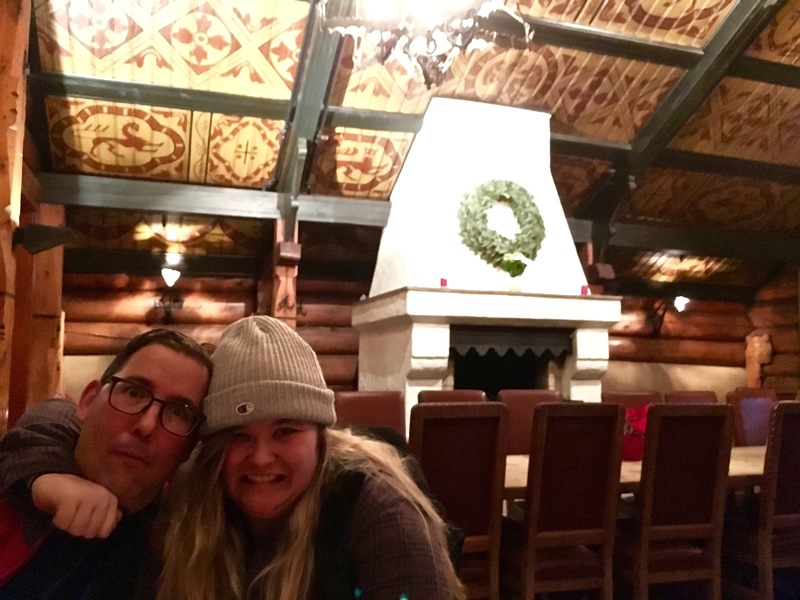 If you want to take a stab at the sled run but have family members that aren’t really up for it, they’ll enjoy sitting by the fireside at the fabulous dragon-style Frognerseteren. Our sled team, now properly equipped, takes a memorial photo before launching themselves down the run. 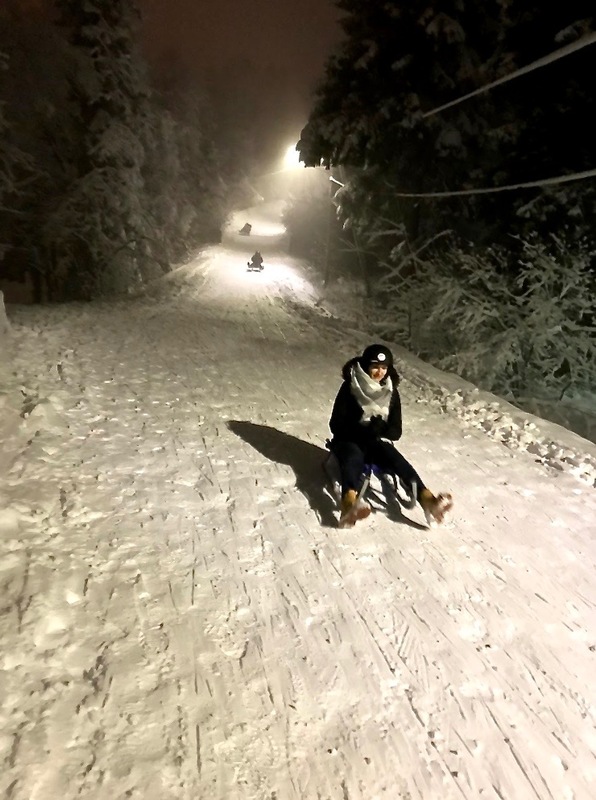 Korketrekkeren, an old Olympic bobsled trail, is about 1.25 miles (2 km) long with over 800 feet of vertical drop. It takes about ten minutes to cover the terrain, provided you don’t take a tumble along the way. The sled run goes from the Frognerseteren stop to the Midstuen stop, where you board the train with your sled and ride back up to do the whole thing all over again. For the above reasons, I elected to go last in our lineup. My hope was that I could act as the cleanup crew for my family by sweeping their incapacitated carcasses out of the way before they became true roadkill. Fortunately, they all survived their first run, no blood shed, although red spatters at certain points in the snow showed that not everyone had been so lucky. And when we got to the bottom of the hill, we had to marvel at some of the survivors. One Chinese tourist had made the run wearing a tulle Dior skirt, a Louis Vuitton bag, and a pair of Prada Mary Jane’s. A true fashion risk taker. A group selfie, taken beneath an old photo of Frognerseteren, which was built in 1891. 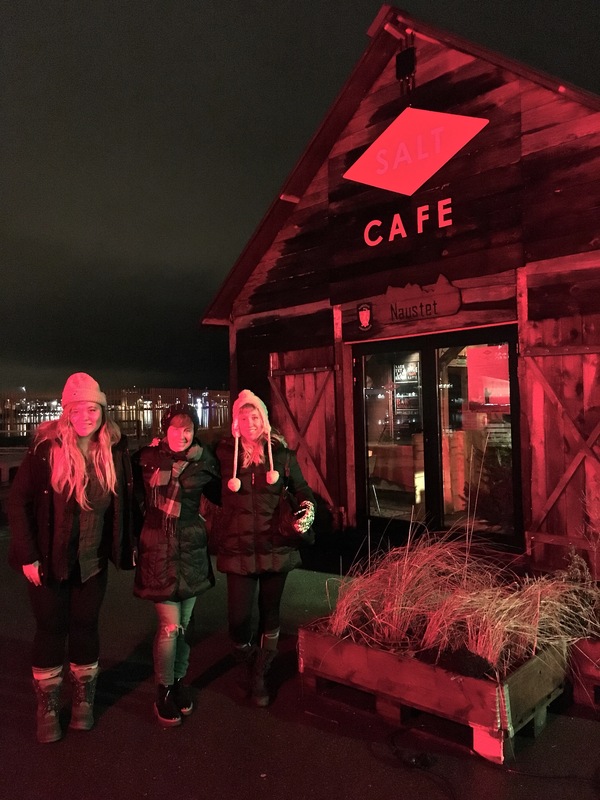 We took the downhill plunge three times before hunger set in, so we met up with my mom for a quick meal at Kafe Seterstua, Frognerseteren’s cafeteria-style restaurant — a great place for traditional Norwegian food like meatballs, moose burgers, and reindeer kebabs. After sledding at Korketrekkeren, check out the comforts that await you inside Frognerseteren’s Kafe Seterstua. You never know who you might meet, like these two characters. Pictured is The Arctic Pyramid, where concerts and other public events are held as part of SALT. We’d made an online reservation for the private Sauna Naustet, and although we arrived late, the barkeeper kindly let us stay until closing time. The heat and beer were just what we needed to ease our aching muscles. And the experience was the perfect way to end my long-dreamed-of European Christmas with my family. Another item check-marked off my bucket list. And some great memories to cherish and counterbalance the heartbreak that awaited us just around the corner. PS: Much thanks to Ruthie and McKenna for their photos — I spent too much time cooking and not enough time “capturing the moments” on film! Chilly beer in the hot private sauna. Life just doesn’t get any better than this. Frosty beers get funneled through a little window. After a quick shower adjacent to the sauna, we finished off our beers in the bar and enjoyed the view of the Oslo harbor at night. By the way, the interior of the bar is intended to resemble a typical “hytte” (moutain cabin), the kind your grandparents would have built. How does it feeling knowing my peak Christmas has already happened because no holiday will ever top this? Bittersweet friends, bittersweet. Thank you Kimmie and Matt for creating the trip of a lifetime as you always do. Every detail planned was so thoughtful and quintessential and I’m already nostalgic for the memories made. Love you guys! Love you too, Ru Ru. And I’ve got an idea. How ’bout Christmas in Austria next year? Just an idea 😉 ….